We are pleased to announce that Jennifer Hornyak will be showing her most recent works at Wallace Galleries in Calgary, from April 20th to May 1st 2013. 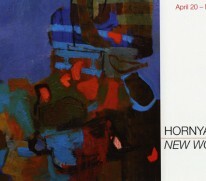 An opening reception will be held on Saturday, April 30th. Images of the new paintings will be available on Wallace Galleries’ website.